At the Prudential Center in Newark, NJ, Sauerland Event and Ringstar Sports (Richard Schaefer) brought a world championship to the city Saturday night. This was part of the World Boxing Super Series. 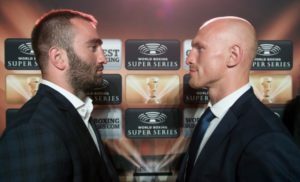 In the Main Event IBF World Cruiserweight champion Murat “Iron” Gassiev, 25-0 (18), of Vladikavkaz, RUS/Big Bear, CA, knocked out former WBC & IBF champion Krzysztof “Diablo” Wlodarczyk, 53-4-1 (37), of Piaseczno, POL, at 1:57 of the third round. In the opening round Gassiev came forward with a jab while Wlodarczyk rarely threw a punch. In the second round it was more of the same with Gassiev landing more punches. In the third round a pair of left hooks to the chin and then the body from Gassiev and down went Wlodarczyk as referee Earl Brown counted him out. The fans were not happy with the loser’s performance. Super welterweight Maciej Sulecki, 26-0 (10), of Warsaw, POL, defeated former WBA World super welterweight champion ECU “Golden” Jack Culcay 22-3 (11), of Darmstadt, GER, over 10 close rounds in a WBC eliminator match. The fans were not happy with the decision. In the first round the much taller Sulecki used his reach keeping Culcay at bay. In the second round it was Culcay forcing the action getting inside of the reach of Sulecki. An overhand right from Culcay to the chin of Sulecki drove him into the ropes just prior to the bell. In the third round both fighters took turns scoring well up until near the end of the round when a Culcay left hook rocked Sulecki. In the fourth round both fighters mixed it up well with Culcay suffering a cut by his left eye from a chopping right hand. In the fifth round Sulecki controlled using his reach and an occasional right to the body of Culcay. Culcay centered in on body shots landing a solid right to the chin of Sulecki near the end of the round. In the sixth round it was all Sulecki using his jab and straight rights to the chin of Culcay who seemed to be taking the round off. In the seventh round Culcay came storming out driving Sulecki across the ring into the ropes. This finally getting the fans into the fight. Culcay with hands to his side was trying to get Sulecki to open up which he did. In the eighth round Culcay kept coming forward while Sulecki countered him well to win the round. In the ninth round Culcay forced the action but Sulecki controlled with his counter punching. In the middle of the round Culcay rallied getting inside of Sulecki’s reach. Near the end of the round Sulecki went down but referee Fields ruled it a slip. Culcay kept up the attack until the round ended. In the tenth and final round a lead right by Sulecki on the chin of Culcay drove him back several steps. Fields ruled Culcay forcing him down by the back of the head twice to the canvas but referee Culcay was looking to end it with a knockout and had Sulecki in trouble at the bell. Judges Paige scored 98-92, Wallace 97-93 and Kenney 96-94. This writer had it 95-95. Cruiserweight Mateusz Masternak, 40-4 (27), of Wroclaw, POL, won a lopsided stoppage over Stivens Bujaj, 16-2-1 (11), Albania/NY, at the end of the seventh round by the order of the ring physician. In the first two rounds Masternak controlled what little action there was keeping the shorter Bujaj from getting inside. In the third round Masternak was trying his best to land chopping rights on the head of Bujaj who kept ducking low with little offense on his part. In the fourth round Masternak delivered a 3-punch combination to the head of Bujaj who seemed frustrated and not doing much of anything. In the fifth and sixth rounds Masternak landed occasional chopping rights to the top of the ever ducking Bujaj throughout the round. In the seventh round a chopping right to the side of he head of Bujaj dropped him. He was up on unsteady legs and didn’t seem to be interested in continue up until the bell. The ring physician was brought in and stopped the match. Super welterweight Skender Halili, 15-2 (13), of Kosovo/Ft. Worth, TX, easily defeated Samuel Amoako, 23-16 (17) GH/Silver Spring, MD, over 6 rounds. Harvey Dock was the referee. In the second round Halili was landing lead rights to the head of Amoako knocking him back several steps. Halili had Amoako pinned in a neutral corner when the round ended. In the third round Halili landed half a dozen unanswered punches. Amoako was completely on the defense. In the fourth and fifth rounds Halili continued to pound to the body and head with Amoako looking to go the distance. In the sixth and final round Halili kept up the pressure but Amoako had a good chin. All 3 judges Barnes, Layton and Taylor and this writer had it 60-54. Super welterweight Money Powell IV, 5-0 (3), of GER/Ft. Mitchell, AL, came off the canvas in the first round to dominate southpaw Brandon Adams, 4-5-1 (2), Oakland, CA, the rest of the way winning in 6 rounds. In the first round Adams dropped Powell with a straight left to the chin. Powell got up and took it to Adams with straight rights to the mid-section and head. In the second and third rounds Powell kept a steady jab and right to the head of Adams. In the fourth round Powell landed a solid right to the chin of Adams spinning him completely around the landed a flurry of punches until Adams clinched. In the fifth round Adams came out throwing punches making Powell back up. Halfway through the round Powell once again took over landing straight rights to the chin of Adams. In the sixth and final round Powell countered Adams with lead rights to the chin right up until the round ended. Alan Huggins was the referee. Judges scores were Barnes 59-55, Layton 59-56 and Taylor 58-55. This writer had it 58-55. Heavyweight Efe Ajagba, 2-0 (2), of NIG/Houston, TX, stopped Luke Lyons, 5-1 (2), of Ashland, KY, at 2:19 of the first round. In the first round the much taller Ajagba pounded on Lyons for half a round, before a left hook to the body dropped Lyons. Ajagba jumped on Lyons as he arose and pounded him with a flurry of punches until he went down a second time. Upon rising referee Dock wisely halted the match.